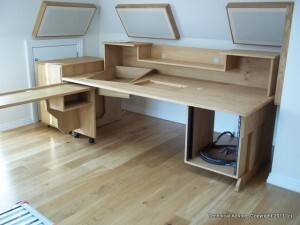 The AVID MC Control Studio Workstation area is constructed with a natural oak finish as standard and there are other finish options available. Hardwood edging comes as standard which visually looks great and also helps to reduce wear and tear to the edges of the workstation. There is a 12unit rack under the right side of the desk and a 10unit rack on the left hand side of the recessed Euphonix MC Control Surface.